Electrosonic has acquired Global Immersion, a digital immersive theater designer and integrator. Global Immersion will continue to serve the planetarium, institutional theater, and giant screen markets. Martin Howe (left), CEO of Global Immersion, with Jim Bowie, president of Electrosonic Group. The acquisition, completed on December 10, 2012, positions Electrosonic to offer digital immersive solutions across the theme park, museum, giant screen cinema and planetarium markets. Founded in 2007, Global Immersion is known for its work with highly specialized and technically-complex digital immersive theaters. The company has won multiple project and business awards, and has established a solid base of digital immersive theater attractions worldwide. Its project portfolio includes the California Academy of Sciences, Adler Planetarium, Moscow Planetarium, Swedish Museum of Natural History, Peoria Riverfront Museum and Reuben H. Fleet Science Center. 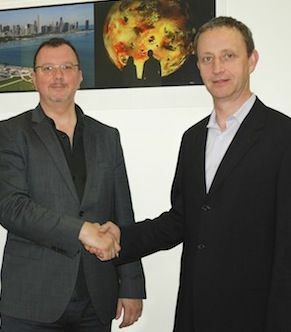 Martin Howe, CEO of Global Immersion, said: “I am delighted with this transaction with Electrosonic. It allows us to further expand our activities and develop our product and service offering, opening up new doors and bringing with it many synergies.